Blox Shorty Antenna for Scion Models; 17-18 Toyota 86 ; 13-18 Subaru BRZ. Get rid of your unsightly OEM Antenna and replace it with a Blox Shorty Antenna. Blox Shorty Antennas are available in 60MM, 80MM and 100MM Lengths. Choose your desired length from the drop-down menu. 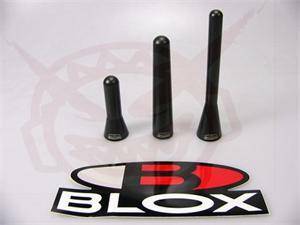 BLOX Racing's stylish replacement mini antennas are CNC-machined from billet aluminum and anodized black. Three different sizes are available as direct replacements for unsightly OEM antennas and will fit all Scion models; 17-18 Toyota 86 ; 13-18 Subaru BRZ. Choose your desired length from the drop-down menu.